Reading your `How I got into Deep Purple’ section has motivated me to look back at my life and Deep Purple so far. 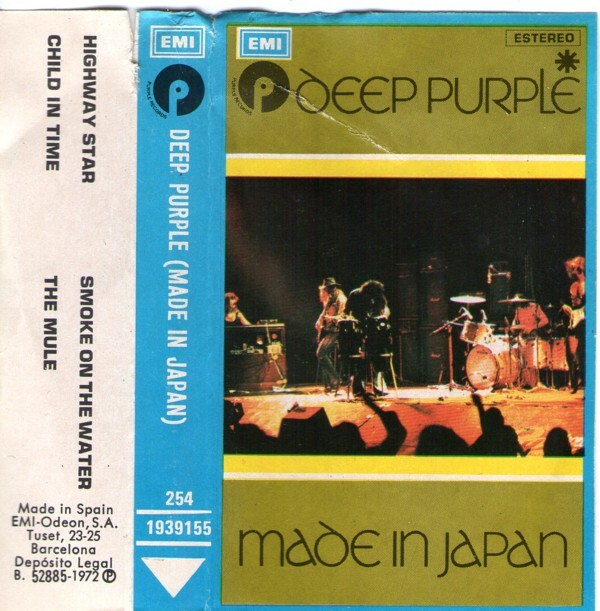 I think I peaked too early in some ways because the first Deep Purple I heard was a cassette copy of Made In Japan whilst we were on holiday in Luxembourg, house sitting for a colleague of my dad who worked at the Court there. It was the barmy summer of ’76 and thus far Queen was the greatest band in my eyes (my entire collection was their first four albums plus The Beatles Sgt. Pepper). I stumbled across a few tapes in one of the bedrooms and decided to give them a spin on an old portable player. My older brother was impressed by the Tommy soundtrack (The Who) but it was Made in Japan for me and the balance of searing vocals and blistering instrumental sections seemed like heaven; despite the poor sound quality, the musicianship and song writing shone through. I could not wait to get hold of the album when I came home but paltry pocket money meant it was not until Christmas that I received the sacred discs. I can remember the power of my dads’ old radiogram (a record player and radio combined in an antique style cabinet) blasting out Highway Star in glorious mono but being frustrated because most of the guitar was in the missing stereo speaker! In the spring of 1977 I saved enough cash to buy In Rock in green vinyl and was initially disappointed at the slow speed of the music (Machine Head more so, pre the stunning 1997 remix) compared to the full-on drive of Made in Japan, but slowly this album would become my favourite studio album by the band. I also heard that the guitarist had died and it was some time later I realised it was Tommy not Ritchie who had bitten the dust. For my birthday in June that year I think I had Made in Europe and possibly Fireball. I was obsessed by now and the quest to buy every release was well under way. From the pioneering days of Mk1 through the more bluesy Mk 3 and beyond to the reunion years I have always been excited by the band and their unique position in hard rock history. Over the years I would also discover the solo works of ex-members but it was always Ritchie who held the biggest attraction for me. Seeing him at Bingley Hall, Stafford on the Difficult to Cure tour was a real milestone in my musical education despite a wall-of sound mix and volume pushed to the wrong side of excessive. The unique guitar style, the offhand way he treats his talents (but not his band mates) have always impressed me and added to the enigma and it his presence in any band which defines its sound and character above all else. So it was a sad day for Deep Purple when he decided to leave for the last and final time because my interest in the current line up is cursory. I did see them on the Abandon tour but was left with the impression of seeing a superior Gillan band and not the sort of Deep Purple I can get exited about; all too professional and lacking spontaneity and the magical extended improvised sections from the 70’s, not to mention the guitar styling of Ritchie. Not that his current band of minstrels is very inspiring either. As an occasional diversion from a mainstream career it would work but after 15 years he has killed the genre and we all live in hope of a rock renaissance (pun definitely intended!) before it is too late. The 30th anniversary of Rainbow’s birth has been and gone so prospects for this are slim. Meanwhile I shall continue to enjoy the `classic’ Deep Purple material alongside current flavours Nightwish amongst many others.